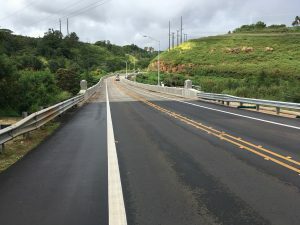 HONOLULU – The Hawaii Department of Transportation (HDOT) held a blessing ceremony to mark the opening of the rehabilitated Kipapa Stream (Roosevelt) Bridge on Kamehameha Highway in Mililani. HDOT partnered with the Central Federal Lands Highways Division (CFLHD) of the Federal Highway Administration (FHWA) to complete the work on the 85-year-old bridge. 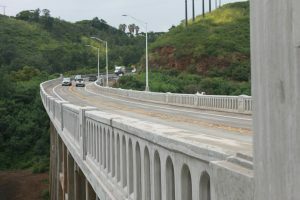 The Kipapa Stream Bridge was originally constructed in 1933 and is located between Ka Uka Boulevard and Lanikuhana Avenue. 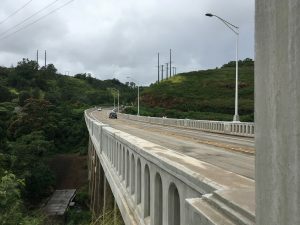 It is approximately 484-feet long and the bridge width increased from 30 feet to 36 feet which boosts safety for all users, including bicyclists and pedestrians. 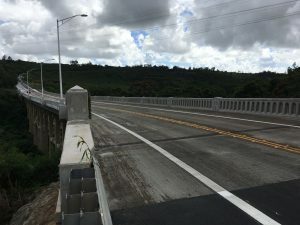 Project improvements include repaving the roadway, widening the bridge to provide 7-foot shoulders in both directions, enhancing the structural capacity and seismic retrofit to meet current design standards, replacing the railings, restriping the travel lanes and increasing the vehicle weight limit from 16 tons to 40 tons. The $19.4 million project is funded with 80 percent federal and 20 percent state highways funds. HDOT completed additional safety improvements on Kamehameha Highway between the Kipapa Stream Bridge and Lanikuhana Avenue. The roadway was restriped to accommodate two 11-foot travel lanes (one northbound and one southbound), a 3 to 6-foot center median and 4 to 6.5-foot shoulders on both sides. The improvements increase safety for all users including motorists, motorcyclists, bicyclists and pedestrians by providing more shoulder space and reducing the risk of head-on collisions. 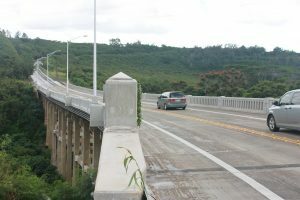 Between 2012 and 2016 there were 13 motor vehicle crashes due to a vehicle crossing over the center line on the north side of the bridge (which did not have a center median) vs. four on the south side of the bridge (which does have a striped median). HDOT conducted a traffic study and determined no significant impacts to traffic from the adjusted striping. The results found the travel time from Ka Uka Boulevard to before Lanikuhana Avenue differed by an average of only 15-34 seconds. For additional information regarding the new safety features and the study please click here. Please courtesy “HDOT” or “Hawaii Department of Transportation” if photos from the ceremony are published. 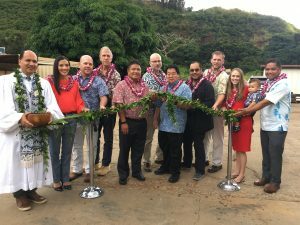 (From left to right) Kahu Kordell Kekoa; Representative-Elect Val Okimoto; CFL Project Manager Mike Will; Hawaiian Dredging Construction Co. President Gerry Majkut; HDOT Director Jade Butay; FHWA Hawaii Division Administrator Ralph Rizzo; Representative Ryan Yamane, Senator Donovan Dela Cruz; CFL Chief of Engineering Curtis Scott; Representative Lauren Matsumoto and her son Noah; Representative Henry Aquino, participate in the blessing ceremony for the new Kipapa Stream (Roosevelt) Bridge. 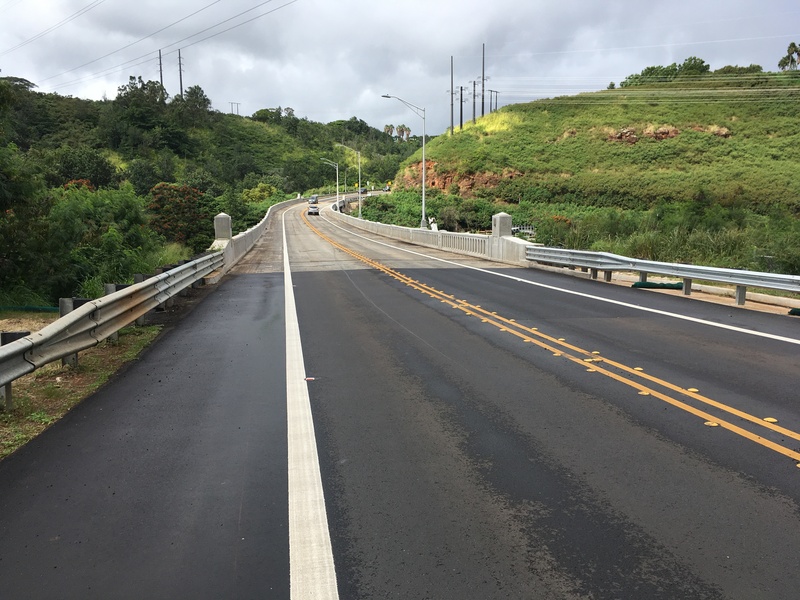 The rehabilitated Kipapa Stream (Roosevelt) Bridge has new pavement and is now wider with 7-foot shoulders in both directions making it safer for all users. The project enhanced the structural capacity and seismic retrofit to meet current design standards and increased the vehicle weight limit from 16 tons to 40 tons. 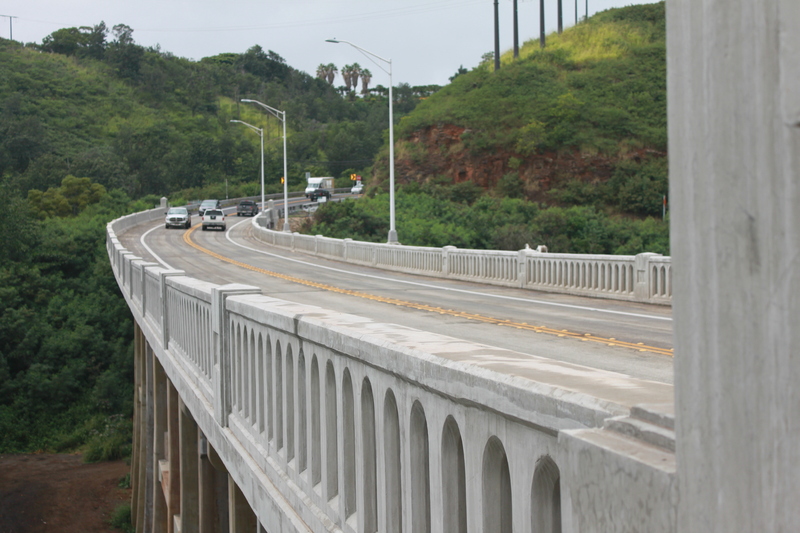 The rehabilitated Kipapa Stream (Roosevelt) Bridge features new railings, drainage and street lighting. Ti leaf and the maile lei were placed on the bridge following the blessing ceremony.